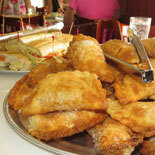 See the best of Miami on the Historic Miami Tour and Boat Cruise. This full-day tour includes Miami Beach, Downtown Miami, Coconut Grove, Coral Gables, Little Havana, Biscayne Bay, plus hundreds of other interesting landmarks, famous movie locations and weird stories that only the knowledge and experience of a local tour guide can offer. Welcome to Miami Tour Company! 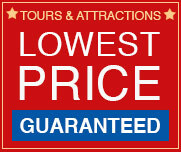 Your one-stop shop for the best tours, at the lowest prices, available in Miami. 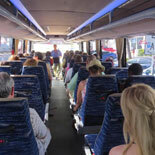 Tour in state-of-the-art vehicles, offering GPS guided audio tours in 5 languages. The first stop on Historic Miami Tour is at Fresh Market, (from Bravo TV's "Top Chef") where you can grab a bite to eat. (Lunch is not included but stop is made) The bus also stops along the way at Our Lady of Charity Shrine, Little Havana and Bayside Marketplace. At each stop, there is plenty of time to exit the bus, take pictures and stretch your legs. You will see Miami's highlights -- South Beach; Downtown Miami; Brickell; Coconut Grove; Coral Gables, Little Havana; and Ocean Drive. Along with some lesser-known areas like the Gianni Versace Mansion, Holocaust Memorial, Madonna's House, Sylvester Stallone's House, Vizcaya, Watson Island, Cartagena Plaza, Coral Gables Waterways, University of Miami, Biltmore Hotel, Venetian Pool, Miracle Miami, Calle Ocho, Old Cutler Road, and the secret spot where Michael Jackson filmed his "Thriller" music video, plus hundreds of other interesting landmarks, famous movie locations and weird stories not seen with other tour companies. This Tour also includes a fully-narrated bilingual sightseeing cruise aboard a stylishly, comfortable modern 140-Passenger yacht. Each vessel features restrooms, an air-conditioned lower salon, enclosed in picture windows, as well as an upper-deck with an awning that will protect you from the sun and seasonal rain showers. Cruise around Biscayne Bay, Miami's spectacular waterway, the downtown Miami skyline, Miami Beach, Port of Miami and Fisher Island. Be sure to keep your eyes peeled for the rich and famous, as you relax on the upper deck of the yacht. Experience Miami City the right way. Make your reservation and buy your eTicket today for the Historic Miami City Tour and Boat Cruise and let Miami Tour Company show you around! 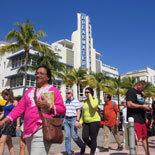 See the best of Miami on the Historic Miami Tour and Boat Cruise. Child Ticket: 3-9 years old. 2 years and under are free. Reservations are required at least 48 hours in advance of desired tour. Complimentary hotel pick up is available. Call the Customer Service number (found on your eTicket) 48 hours in advance of tour to arrange pick up. Car seats are not available on sightseeing tours. 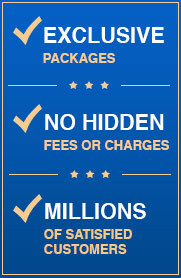 48 hour cancellation policy - with No Cancellation Penalty. After the 48 hour cancellation period, there are no refunds. However, you will receive a voucher to reschedule the trip..